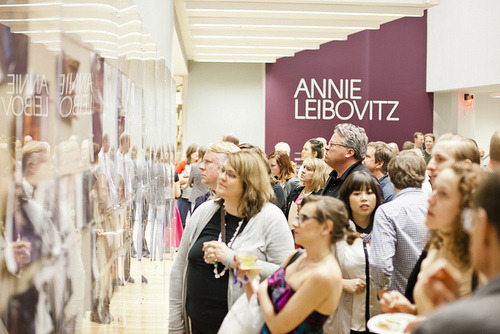 On September 22, the Wexner Center for the Arts opened the Annie Leibovitz exhibition. 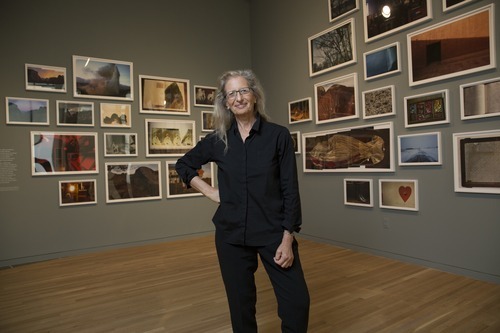 This was a highly anticipated exhibition for many reasons, but especially because it was to be the first time that an institution had collected and exhibited as a whole Leibovitz’s Master Set, an “authoritative edition of 156 images [Leibovitz] personally chose” as the images that define her career. In addition to the Master Set, the exhibition also features Pilgrimage, a series of photographs of houses, buildings, rooms, landscapes, and other possessions of historical figures such as Abraham Lincoln, Emily Dickinson, Ralph Waldo Emerson, Annie Oakley, and others, which capture their characters in a completely new and original way. Thirdly, a lobby display features portraits and prints by Leibovitz of artists who’ve actually been featured in the Wexner Center previously. Annie Leibovitz has taken some of the most iconic pop culture photographs of all time. If I mention the Blues Brothers their faces painted blue, or a naked John Lennon spooning Yoko Ono, or a pregnant Demi Moore naked on the cover of Vanity Fair, chances are you can picture these images in your mind. So, when I went to the exhibition a few weeks ago, I already had an idea of an “Annie Leibovitz” photo in my head. I was aware that she was a photographer (duh) and that she photographed some of the biggest American pop culture icons, and that her the nature of her compositions were somewhat surreal and dramatic. But I was not prepared to be so totally blown away by this exhibition. The first thing I noticed about Leibovitz’s photos, especially seeing them in large print form, as opposed to in a magazine, is the care taken in the composition. Almost all celebrity photos lack the kind of thought and care, their “power” (if there is any) based solely on whom the subject is, not the photo. This is the complete opposite of Leibovitz’s photos. Her photos of, say, Whoopi Goldberg in a bath of milk, or David Byrne dressed as a tree, or the White Stripes reenacting a knife throwing show, interpret familiar cultural icons in ways that are eye-opening or contradictory to how we usually think of these celebrities. What Leibovitz’s images do is turn the idea of these celebrities into works of art. One of my favorites was her 1995 portrait of Tony Curtis and Jack Lemmon. In the photo, Curtis and Lemmon, both 70 years old, are wearing makeup reminiscent of Some Like It Hot, while Lemmon is wearing a nightgown and Curtis is in his underwear holding Lemmon’s hand. The iconography is obvious, but the passing of time twists the context and creates a new way to see these two actors. Another thing that struck me about Leibovitz’s work is the breadth of the type of work that she does. Her portraits span the worlds of music (Byrne, Miles Davis, Laurie Anderson, Mick Jagger), movies (Meryl Streep, Arnold Schwarzenegger, David Lynch and Isabella Rossellini, Brad Pitt), politics (the Bush administration, Bill Clinton, Hillary Clinton, Michelle Obama), sports (Muhammad Ali, Martina Navratilova, Wilt Chamberlain), and art and letters (Susan Sontag, Joan Didion, William S. Burroughs, Louise Bourgeois). Obviously, these portraits are all beautifully whimsically shot. However, there are also the photos that aren’t as choreographed. Take, for instance, the photo of White House staff rolling up the carpet on White House lawn as Richard Nixon’s helicopter is taking off in the background, transporting the disgraced ex-president for the last time. There are also the photographs taken in Sarajevo and Rwanda, smears of human gore on walls and asphalt, which speak to Leibovitz’s ability to say something by just being there. One photo that really sticks out in combining her portraiture and her spontaneity is a famous photo of Bill Gates. While Leibovitz was setting up for her shoot with the king of Silicon Valley, Gates wandered off to his office to check his computer. Leibovitz, finding him there in front of his computer, photographed him in a way that perfectly captures the idea Bill Gates. The way the exhibition is laid out in the Wexner gallery also lends to the overall effect. The order of the photos is mostly chronological, and as you walk up the ramp that travels through the gallery, you enter different sections that represent the different stages of Leibovitz’s career. You can see the artist changing and maturing, trying different things. Then, near the end, you find yourself in The Pilgrimage section, which feel familiar as portraits, but they’re more deconstructed. They capture great historical figures by capturing the detritus of their lives—the places where they lived and worked, the sorts of possessions they kept, the things they’ve created. It’s a striking room that makes you, especially in the context of the Master Set, think about history and the legacies we leave behind. By the end of the exhibition, I was in a daze. I was so struck by the exhibition that I wanted to find out more about it, so I contacted Karen Simonian, the Director of Media & Public Relations at the Wexner Center, and asked her a few questions, which she was kind enough to answer. Annie Leibovitz’s photos are obviously iconic. But seeing the complete Master Set and Pilgrimage collected together in the Wexner Center exhibit was a completely new experience. What kinds of personal reactions do you have to the exhibit? Did you see anything that you hadn’t seen in Leibovitz’s photos before? To see the complete set is almost jaw-dropping. Of course I’ve seen her work in magazines, online, and in other museum exhibitions, but I was stunned to see the scope, scale, and diversity of her work, and so much of it all at once. Pilgrimage was surprisingly moving, but then so are a great many of the portraits. She told the story about Mikhail Baryshnikov being lifted by Rob Besserer in her 1990 image of them—thereby, in a sense, achieving the heights again that he could in his youth but could no longer manage. Much of the show reveals the humanity behind the celebrity, in various ways. For me, the show also reads like a walk through the cultural and political history of my lifetime. I also think the artists’ wall in the café—featuring artists who have been to the Wex over the years—reveals where “Annie’s world” and the Wex world overlap. It’s a fascinating overview of artists who have been through town or created work here over the last 23 years. Having the complete Master Set and Pilgrimage collected together is a pretty darn good “get.” What was the process of putting this exhibit together like for the Wexner Center? How did the opportunity arise? What went into the organization of the exhibit? I’m going to throw most of the credit here to the persuasive powers of our intrepid director, Sherri Geldin! Through a variety of circumstances, she had formed a relationship with Leibovitz, and along the way had heard that Leibovitz’s Master Set had never been exhibited in a museum. Sherri suggested it at one point, and lo and behold, Annie decided to let the Wex show it. Leibovitz did come to tour the Wexner Center and Ohio State earlier in the year, and was satisfied with what she saw. So the Master Set was certainly a coup; Pilgrimage was on tour from the Smithsonian (and the salon-style display is a new one for that set); the third piece of the show is the artists’ wall. It all turned out to be a perfect synergy and a perfect fit for the artist and the Wexner Center. You said that this exhibit is breaking all sorts of attendance records, not to mention receiving a record amount of media coverage, tour bookings, etc. First off, it’s great to hear the Wexner Center getting that kind of coverage, because you folks are awesome. Why do you think this exhibit has been so successful? Additionally, do you think the success of this exhibit says something about, maybe, photography as an art form? 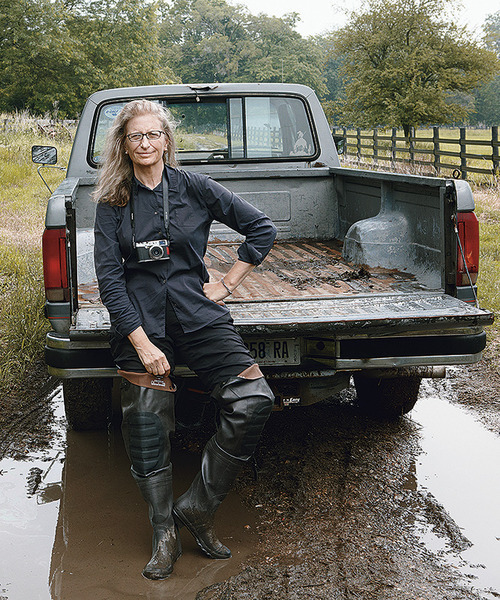 People know the name Annie Leibovitz; they know her work. She is celebrity in her own right! Some of them have grown up with her images. Some of them know her work from her present-day magazine and ad work. Most people instantly recognize a pregnant Demi Moore, or John and Yoko. This show appeals not only to art fans, not only to photography fans, but anyone interested in fashion, music, pop culture, celebrities, politics, athletes—and that encompasses a huge potential audience! The national media is responding to the news about the 156-piece Master Set, as it’s the first time it’s been on view. I do think this exhibition will only foster more interest in photography as an art form. It’s hard to look at Leibovitz’s portraits or landscapes and not be impressed by the craftsmanship, the composition, the dramatic and witty stagings (Blues Brothers with blue faces, to name just one example), the “eye” that she has, the personality she must have to get the Queen of England to pose without a crown. 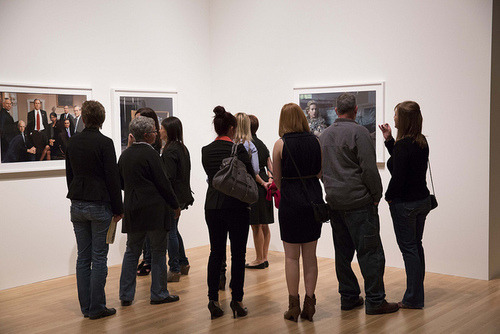 Just an FYI: Our three-night lecture series about contemporary portraiture sold out. Wexner Center for the Arts. Annie Leibovitz Member Opening. Photo: Kevin Fitzsimons. Annie Leibovitz in the Pilgrimage room. Photo: Kevin Fitzsimons. Seriously. Go see the Annie Leibovitz exhibition. It’s totally awesome.